A summer dinner that filled the compost bin. The bag of fresh cranberries in my fridge have been wondering why I've been ignoring them since Thanksgiving, so I decided to add them to the dinner I was making in a cast-iron skillet. Those things stay fresh forever! Even though I live in California, my New England bones were telling me, "It's time for stew!" I made this the other night and have been excited about my leftover lunches this week. This Moroccan-inspired dish is a salute to Jill aka "Jillbot," the biggest fan I know of the sweet/savory combo. 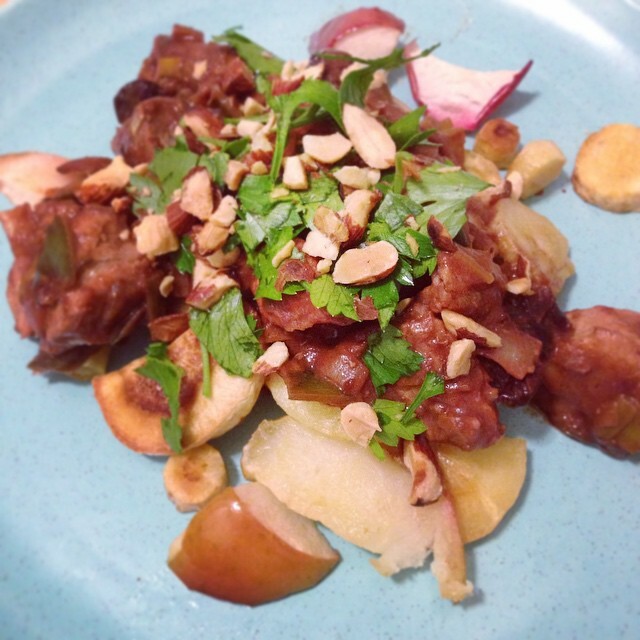 This dish is a mash-up of fall favorites with a Moroccan twist - which I know is weird because people in Morocco don't generally eat pork. I took this Moroccan Chicken recipe and swapped out quite a few items to give it a more harvest-festival-in-New-England flavor. I also didn't have tomato puree but did have pumpkin puree as well as saved Red Velvet Smoothie cubes which provided a flavorful, colorful stand-in for the tomatoes. The smoothie cubes are a complex process, so I'm sure just doing all pumpkin would be delicious as well. Experimenting with Thai food ingredients is always fun, especially when you have a little guidance from the Pok Pok Cookbook. I've only had the courage to try one dish in there so far, but the dressing from that dish (a fried egg salad number called ---) has livened up many a meal since. This meal is a nice balance of creamy/mild/savory/cooked with sweet/salty/tangy/fresh. Add rice and salted tofu to bulk it out if you're hungrier than salad-for-dinner. Lovely bbq parsnips with a fried egg and arugula. Like hash browns, but sweeter and... healthier? Inspired by Cheesboard's cilantro sauce - now appearing on salmon and other delights. Tasty pile of cauliflower, chives, garlic, hot and sweet italian sausages, bunch of broccolini and olive oil. Sweet, savory, crispy, mushy - this meal is an emotional roller coaster of flavor and texture. The beans and sweet potatoes are pretty straightforward. Have been experimenting with wheat-free meals, calling on rice flour as a substitute. This was super easy thanks to some readymades from Whole Foods. The biscuit recipe can be found here, I used rice flour instead of regular flour, and the results were…interesting? Made a simplified version of this spaetzle recipe (using unsweetened coconut milk). Roasted brussels sprouts with normal and lemon-flavored olive oil, fried some garlic up then tossed it all together. Ok so white bean farro doesn’t make for the most attractive snapshot. But it makes up for looking like a pile of barf by tasting great! Carmelize the onions (cook for a long time on med-low with lots o butter) then add more butter and sage and grated parsnips (2). As this all melds together and becomes tasty, boil the gnocchi in fairly heavily salted water. Add to parsnip sautee to toss together before serving. Satisfies in a way that only butter and potato product can. Experimental carbonara made with sautéed soprasetta, tomatoes and Kale Krunchies and an egg scrambled in at the last minute. Wtf delicious! Sautee garlic and sage with small chunks of pear, once reduced a bit and the flavors melded, boil the gnocchi in salted water. Once floating, take gnocchi out of boiling water with a slotted spoon and add to pear mix, still sizzling but on med-low. Add gorgonzola to taste, add small amounts of pasta water if needed. Used Mark Bittman’s humble paella directions, went crazy with the shellfish, with mussels we picked fresh from the Cape Cod Canal. A different kind of lobster roll: steamed lobster, garlic scapes, avocado and sushi rice. First made this when living on the island of Vinalhaven, ME for the summer. I was surrounded by free lobster and living on a small farm where I first encountered garlic scapes.